Arnold Machin was born in Stoke-on-Trent, England, in 1911. He died in 1999. He initially trained as a sculptor, and later worked in pottery, designing works for Wedgwood. In 1940 he won a medal from the Royal College of Art (see image). In 1963 he designed the effigy of Queen Elizabeth II that appeared on all the UK's decimal coins from 1968 to 1984. 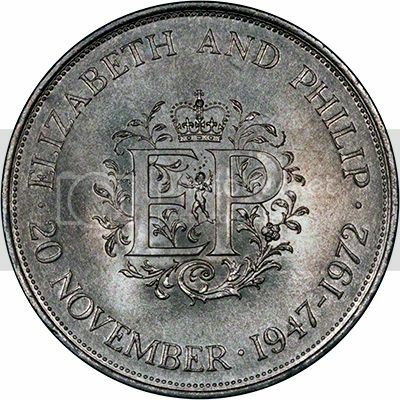 It also appeared the coins of various Commonwealth countries. Rhodesia (now Zimbabwe) was the first country to adopt the portrait in 1964. He produced a similar effigy to be used on the UK's definitive stamps, where it remains to this day. Interestingly, this effigy faces left, while the coin effigy faces right. N.B. Machin is pronounced "Maitchin" - the first syllable rhymes with the English pronunciation of the letter "H" - "aitch" (or increasingly "haitch"). Arnold Machin also designed the reverses of the Bahamas first circulating decimal coins, below, first issued in 1966. He also designed the Guernsey square ten shillings of 1966. At first he thought of portraying William the Conqueror in Norman style, with beard and longer hair, but eventually he settled on the Saxon style. The reverse of the crown issued in 1977 to celebrate QEII's silver jubilee was designed by Machin - not, in my opinion, one of his successes. Nevertheless, since 1964, Machin's effigies of QEII have appeared on literally billions of stamps and coins the world over. 1] Arnold Machin: Pattern Decimal Halfpenny of 1963. 2] Guernsey square 10 shillings, plus alternative design. 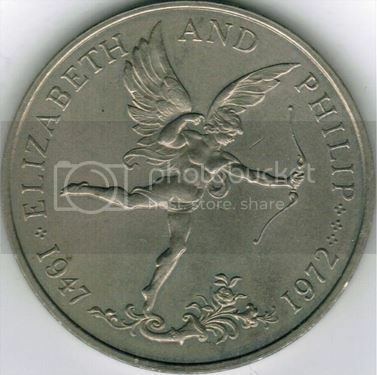 Great Britain, 25 pence, 1977. Silver jubilee. Guernsey, 25 pence, 1972. Silver wedding anniversary of the Queen and the Duke of Edinburgh. Great Britain, 25 pence, 1972. Silver wedding anniversary of the Queen and the Duke of Edinburgh. Sultan Hassanal Bolkiah succeeded to the throne in 1967, and his portrait, also by Mr Machin, appeared on the coinage in 1968. In 1966 the Royal Mint hired Arnold Machin to design the reverse of a collector crown for Gibraltar, showing its coat of arms. Gibraltar issued a crown bearing this design from 1967 to 1970. Machin was famous for his effigy of the Queen, which appeared on the obverse of the Gibraltar crown and on millions of other coins throughout the world. Arnold Machin designed the reverses of the gold coins that were issued in 1967 to commemorate the Bahamas' new constitution. The designs depict Christopher Columbus, the Santa Maria (one of his ships), a fort and a lighthouse.